Made in the USA. Ages 18+ due to presence of magnets. We made a short demo video (below) showing off a few of the things you can do with the fascinating magnetic fluid, ferrofluid. A liquid magnet = hours of fun. You can spike it, toss it, drop it, stretch it, bridge it, and make it dance. It's basically a fidgeters dream come true. 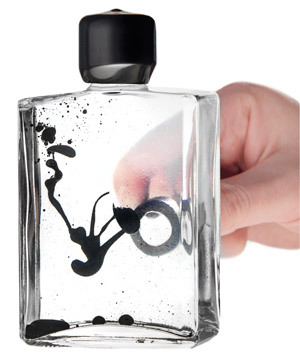 Because ferrofluid can be messy and stains easily, the manufacturer smartly sealed it inside a bottle. Plus, its metal cap makes for a great place to store the included magnet when not in use. Simply put, Ferrofluid in a Bottle is the best way to experience the magic that is ferrofluid. Ferrofluid is a liquid that responds to magnetic fields. Those spikes are magnetic field lines! Most of us have performed (or seen pictures of) the classic magnetic field experiment. You place a bar magnet underneath a piece of paper and then sprinkle iron filings on top. The filings arrange themselves in such a way as to approximate the magnetic flux lines. 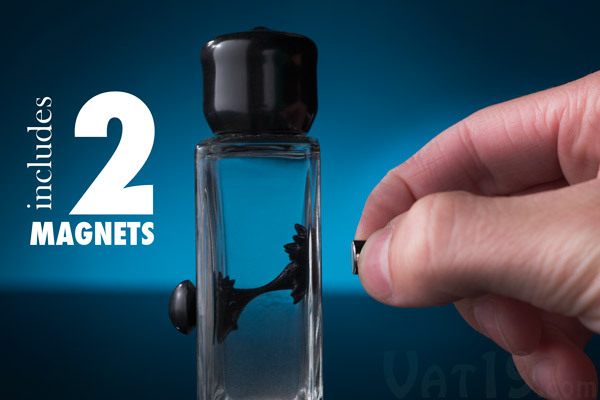 Using Ferrofluid in a Bottle, you can see this phenomenon in real-time and in 3D! The stronger the magnet, the larger the spikes. 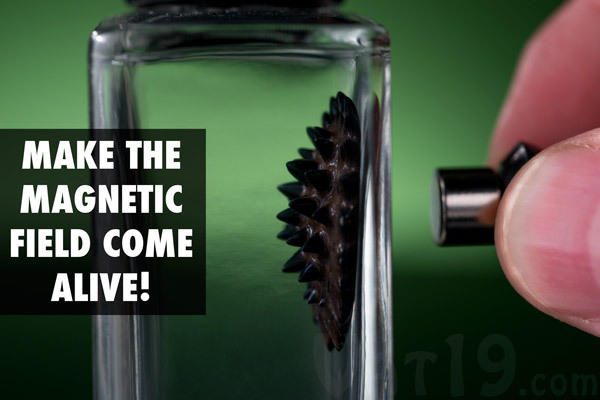 And the closer the magnet is to the ferrofluid, the closer the spikes will be to each other. Usage note: Leaving the magnet against the ferrofluid for extended periods of time can cause irreversible damage to your ferrofluid such as it no longer being able to spike. When not in use, keep the included magnet attached to the cap of the bottle or in a separate location. Observe magnetic flux lines by placing a magnet close to the ferrofluid. 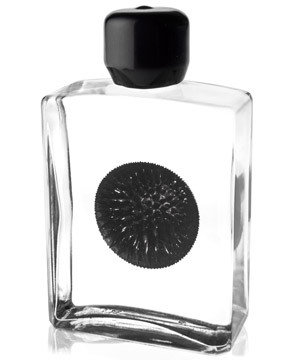 Ferrofluid in a Bottle (60 mL size) includes two small neodymium magnets which allow for some über cool interactions. You can bridge the fluid across the walls of the bottle as well as create a yo-yoing effect by moving the magnets back and forth. When you're done, you can store the magnets on the top of the bottle cap. Create the bridge effect using the two included magnets (60 mL bottle only). 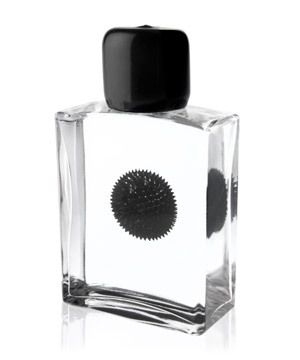 Ferrofluid in a Bottle is currently available in two sizes: small (60mL) and large (120mL). Bottle Dimensions 3.75" x 1" x 2.125" 4.5" x 1.5" x 2.5"
Please note: There is 4 times as much ferrofluid in the large size than the small size. Question: How does this stuff work? Answer: Magic! The magic of science, that is. Ferrofluid is created by immersing nanoscale particles of magnetite, hematite, or an iron-containing compound in a carrier fluid. Thus, this suspension contains both solid and liquid particles. Question: Is this the same stuff you used in that awesome Talking Bottle Opener video? Answer: Good eye! To create some of the "artsy" and cologne commerical-esque effects in the Hans Gretel Talking Bottle Opener video, we used ferrofluid. Question: What ages is this for? 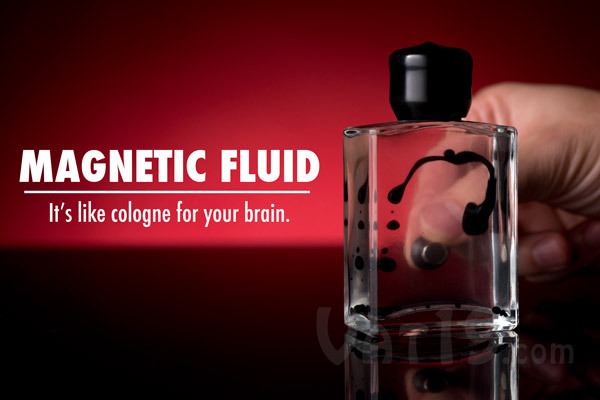 Answer: Ferrofluid in a Bottle is for ages 18+ due to the inclusion of neodymium magnets. Never ingest magnets or use them as fake facial jewelry. They can be extremely harmful if swallowed. Question: You said that ferrofluid stains. How does the glass not stain? Answer: The manufacturer uses a special blend of 14 different suspension liquids to prevent staining of the glass walls. If you were to open the bottle (it's not easy, but do not try!) and get some ferrofluid on your hands, it will stain. You will need to wash your hands repeatedly to remove it. Question: Can you drink the fluid inside the bottle? Answer: No. Ferrofluid in a Bottle is not a refreshment. Don't drink it. Question: The suspension looks cloudy. What gives? Answer: That means it's too cold. Allow the suspension to warm up to room temperature and it will clear up. Question: Is ferrofluid just for awesome fidgeting? Does it have any practical uses? 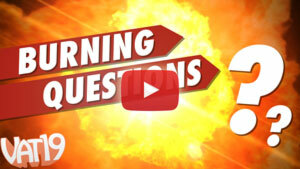 Answer: Ferrofluid has many practical applications. It can be found in hard drives, MRI equipment, and optical filters. But, yeah, it's pretty awesome for fidgeting.